It seems the weather cleared up just in time. This morning was calm, cloudy with occasional sun, and a bit on the chilly side but good painting weather. The waves were so-so but, good enough to study. I still have a bit to go to achieve and understand what I want to. 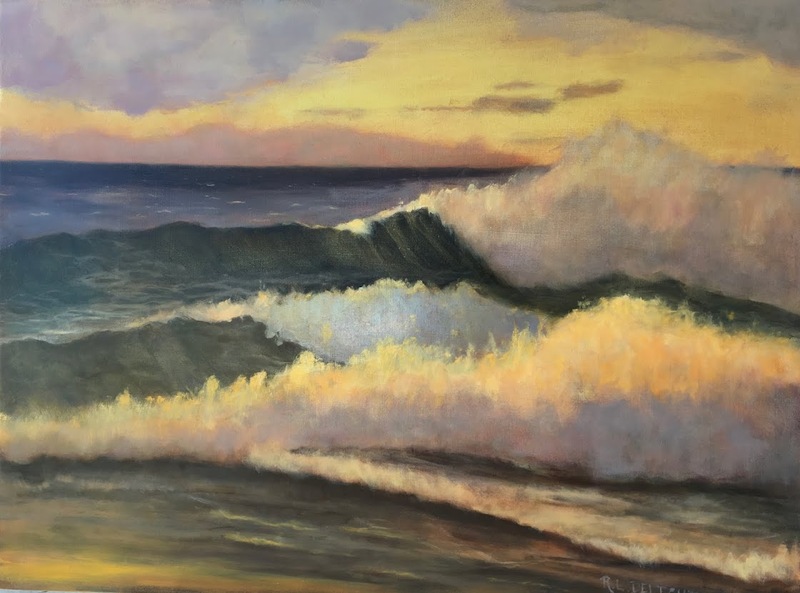 I am getting faster at painting waves. Must be all that practice. This one was painted in an hour plus. As I get faster, I can get more information in and work on values, brushwork, color, etc. Of course, I still have those times when the painting just plain fails. I learn from those too but they aren't as much fun. I had a challenging time getting started this morning. Our band rehearsal went late last night. I need to get enough sleep in order to get out in the weather and paint anything resembling what I see in front of me. As a result, I got a later start than I wanted to. My turps (OMS) in its leak-proof, sealed container...leaked. Of course, I had just refilled it with fresh. My pack took a header in the car and ended upside down on the floor. I don't know why I didn't set it on the floor as usual. I think the force of falling upside down might have loosened the seal and allowed the container to leak. Fortunately I don't trust things like that in general and had it in a zip lock bag, which, considering the age of the bag, it is amazing that it managed to contain the leak. No turps were leaked or spilled onto the beach. The same incident with the pack caused my freshly laid out paint on my palette to slide and mix with one another. That is a first for me too. I also managed to drop the lid to the turps container into the sand, wet side down. Fortunately I was in a philosophical mood and just shrugged it all off, cleaned up as best I could and got the above painting! It is spring break time around here which means a lot of families with kids and dogs wandering up and down the beach and our one main street in town. One beautifully freckled little girl very earnestly interrupted my concentration to tell me that my painting was very very good. She had snuck up on me and I didn't know she was standing there. I gave her a smile and a thank you and she went on her way. 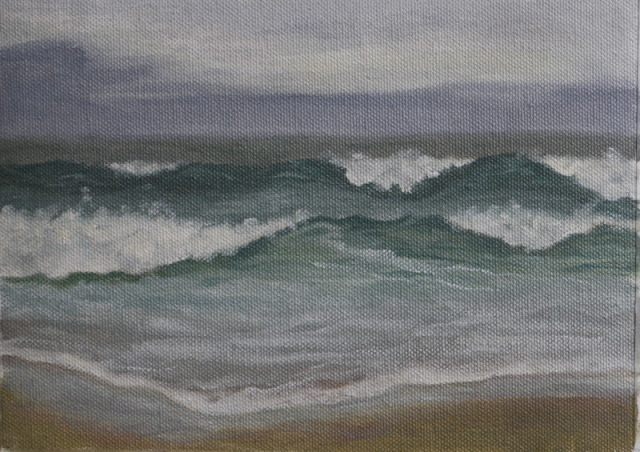 I had an appointment this afternoon up the coast so I was only able to get the one wave study in but it is good to be back in the saddle after my mini break from wave painting with a lot of exciting things to come.